Between all the amazing theater, music, museums and, of course, bars and restaurants New York has on offer, it can be pretty damn hard to answer the question: What should we do tonight? The city has a pretty packed social calendar—with plenty of tantalizing options, but a few events stand out for their world-class offerings of sounds, images, bites and sips. Read on so you can pencil in the best events on your calendar. A celebration of women in food hosted by the cutting-edge, semiannual publication Cherry Bombe, March’s Jubilee brings together some of the food world’s brightest female luminaries for a day of conversation at Manhattan’s Highline Hotel. Presented by CB co-founders Claudia Wu and Kerry Diamond, the Jubilee brought chefs such as Brooklyn’s Elise Kornack and San Francisco’s Dominique Crenn into dialogue with TV hosts including Ina Garten and Padma Lakshmi in 2015. We can’t wait to see who’ll show up in coming years. Given the increasingly grueling nature of NYC winters, it’s a true relief when, come April, the city’s many parks explode with color. The Brooklyn Botanic Garden blooms a bit brighter than most of the city’s green spaces; not only because of its cherry blossom trees, which unfurl their stunning pink flowers beginning in early spring, but also because of the wacky, technicolor costumes of the revelers who descend on the garden the last weekend of April for Sakura Matsuri, BBG’s Japanese-style celebration of cherry blossom season. Over the course of two days, the garden presents a packed roster of taiko drumming, folk dances, tea ceremonies and other Japanese traditions, and attendees typically dress the part in bright kimonos, elaborate face paint and wigs, accented by rainbows of paper umbrellas. In early June it’s time to pack a picnic basket, pour a bottle (or two) of rosé into a Nalgene, and head down to the Prospect Park Bandshell, where, several nights per week, excellent musical acts take the stage. In 2015, bands ranged from indie darling Will Oldham to veteran country crooner Willie Nelson. Most concertgoers bring their own snacks, but in case hunger lingers, satisfying options include elevated comfort food from Brooklyn’s The Farm on Adderley and massive ice cream sandwiches from The Good Batch. Not once but twice in one summer, fans of the Roaring Twenties—or at least of its over-the-top fashions—are treated to a weekend-long celebration of good music and good times out on bucolic Governors Island. The fun of the Jazz Age Lawn Party, which nods the F. Scott Fitzgerald era with swinging dance bands, exhibitions of vintage motor cars and plenty of classic cocktails—begins on the ferry ride over to the island, where sartorially smart revelers show off their flapper dresses, festive toppers and waxed moustaches. Even if you choose not to dress up (which would be a grave error), the people watching alone is worth the price of admission. The CMJ Music Marathon, going into its 36th year, is a whirlwind that descends upon NYC bars and clubs each October. Over the course of six days and nights, hundreds of solo artists and bands in every genre take the “stage”—often in tucked-away corners of bars or itty-bitty venues. In 2015, notable acts ranged from indie wunderkind Car Seat Headrest to trash-punk collective PC Worship, on stages located within a Williamsburg car wash center (yes, really) and downtown mainstay Santos Party House. With Lagunitas Brewing Company as a sponsor, it’s no surprise that many events boast free booze, a perk that certainly enhances the full-throttle, no-sleep week that is CMJ experience. 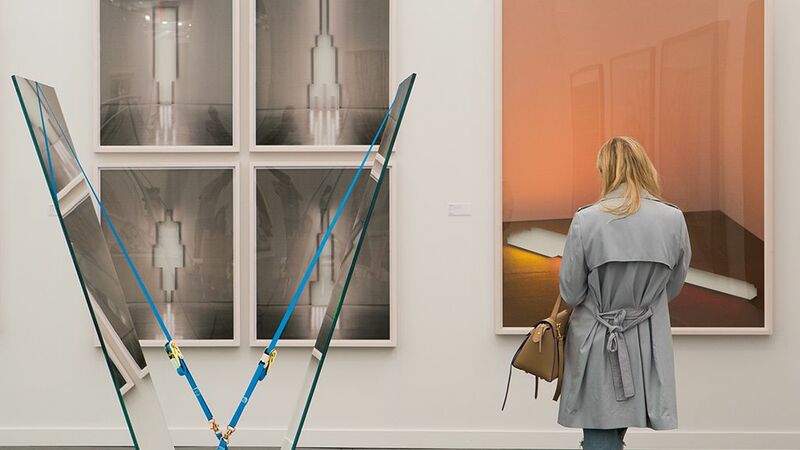 Since its launch in the summer of 2012, Frieze New York, the stateside interpretation of London’s famous contemporary art fair, has been a sensation. Housed inside a custom-built, temporary tent that’s flooded with natural light, the fair takes place on Randall’s Island, whose somewhat limited accessibility—think a 20-minute ferry ride or a lengthy ride across the Robert F. Kennedy bridge or quite a hike over a footbridge on the Upper East Side—enforces its chic air of exclusivity. Frieze is a carefully curated exhibition of cutting-edge, living artists whose work often touches upon the political, the controversial, or both. It’s a must-visit for art buffs, but is also a blast for fans of food drink, with beloved NYC vendors including Prime Meats, Roberta’s and Morgenstern’s Finest Ice Cream providing bites for the event. New York is known as one of the world’s theater capitals, and while big-budget Broadway productions are what most tourists seek out, the true soul of the city’s live performance thrives far from the bright lights of Times Square, in NYC’s innumerable tiny theaters and performance spaces. Each August, FringeNYC—one of seven Fringe festivals throughout the country—celebrates these off-the-beaten-path performances, as well as the playwrights, choreographers, actors and dancers that bring them to life. In small spaces such as the Soho Playhouse and Under St. Marks, Fringe hosts a diverse group of up-and-coming artists, many of whom later achieve fame: Fringe alums include Bradley Cooper and Mindy Kaling. For unadulterated—but very adult—summer fun in the sun, there’s no better destination than Coney Island’s annual Mermaid Parade. Each June on Surf Avenue, the faded seaside resort community’s main thoroughfare a Technicolor procession featuring thousands of revelers decked out in barely-there costumes boogie down the street with wanton abandon. Funky marching bands lay down stomp-able beats, and vendors such as Coney Island Brewing Co. and Brooklyn Brewery keep the suds flowing and the heat at bay. When hunger strikes, just stroll on over the boardwalk for a classic Nathan’s dog. Allow us a self call for just a moment. Our annual Wine & Food Festival is the place to be for those who love not just eating food, but also thinking, talking and learning about it. From hands-on classes to wine tastings to intimate dinners and discussions with food personalities such as Alice Waters, David Tanis, Gabrielle Hamilton and Charles Phan, the four-day NYCWFF provides plenty to eat—and plenty of food for thought, too. In the past, New York’s grillers of hot dogs and street meat have struggled with the city’s complicated and expensive laws on food truck and cart ownership and operation. Luckily, the non-profit Street Vendor Project advocates year-round for the mobile cooks and each September, the organization holds its Vendy Awards, recognizing the best of the best in a number of categories including People’s Choice and Rookie of the Year. Best of all, attendees get to ferry over to lovely Governors Island and feast on vendors’ tacos, fries, snow cones and much, much more.